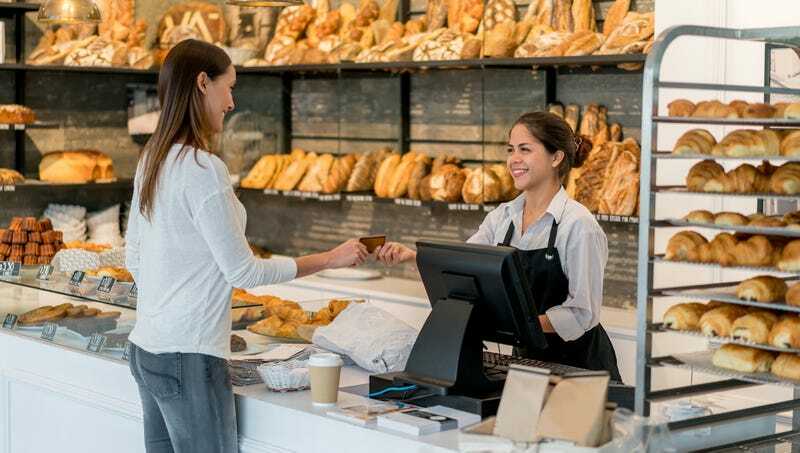 EAST LANSING, MI—Flushed with embarrassment after uttering the phrase “Have a delicious day!” countless times throughout her Wednesday morning shift at Everything Nice Bakery, cashier Guila Charlton expressed indignation that company policy forced her and her coworkers to incorporate the insipid affirmation into every customer interaction. “There is absolutely no way to work ‘Have a delicious day’ into a conversation organically. It makes customers uncomfortable when I say it; they either break eye contact or look at me with a mixture of disgust and pity,” said Charlton, whose fellow cashiers said they are still adjusting to the requirement that they refer to patrons as “guest-omers.” “At first I tried to just mumble it underneath my breath, but my supervisor reprimanded me for it. Honestly, I was actually kind of getting used to the old phrase we had to repeat all day. I mean, sure, “Seize the Danish” was cheesy, but it was at least, you know, honest about it. This is goddamn mortifying. My friends are so embarrassed for me they don’t even come around for free muffins.” The regional manager has also issued Charlton and her coworkers new name tags featuring the phrase “Be Delicious” written in Comic Sans.